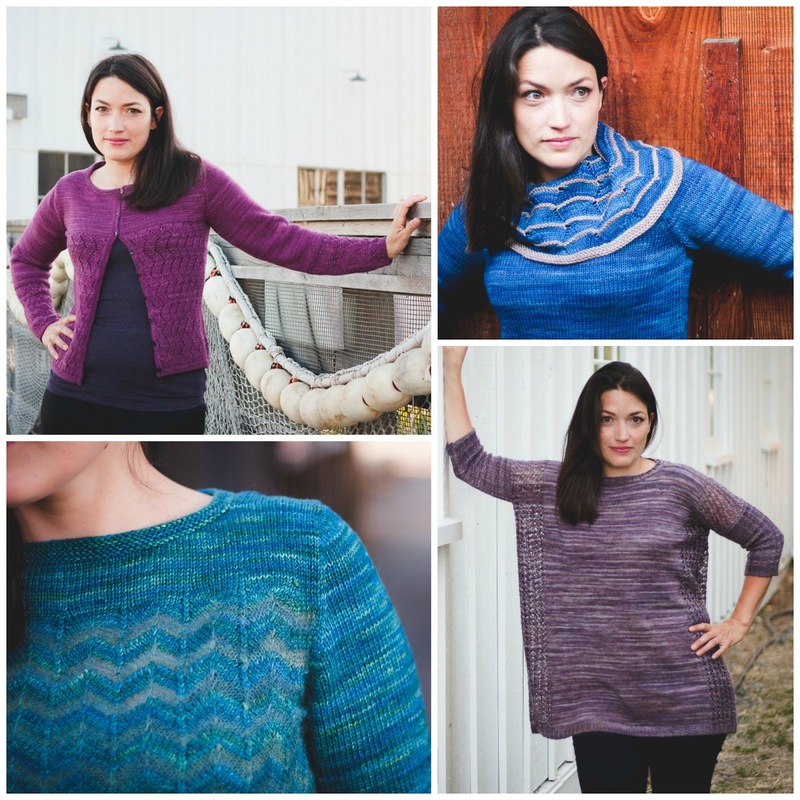 Miso Crafty Knits: Tempest :: Review & Giveaway!! Tempest :: Review & Giveaway!! Judging by my Ravelry project page, there's no doubt that I absolutely love knitting with SweetGeorgia Yarns. Almost all of my cardigans and a good chunk of my sock drawer is knit in SGY. If the 25+ items isn't enough to verify my love, then hopefully the 3-drawer chest that I use as a bedside table that's stuffed to the max with the majority of my SGY stash will confirm it. I fell in love with the bold, vibrant colours that SweetGeorgia is known for from the get-go. It's my goal to knit a garment in every semi-solid colourway that they have (FYI: I only have 12 out of the 58 completed) and to own every colourway in their current lineup (I have no idea where I'm at with this one). I know it will take a long time to accomplish these goals, but I already knew I was an SGY lifer. Earlier this year I had caught wind that SweetGeorgia Yarns was about to embark on a special project. Not much was leaked at first, but little by little tidbits of information slowly came out and soon I discovered that SGY was going to collaborate with knitwear designer, Holli Yeoh, on a collection of patterns for a book! I've always been intrigued by Holli's patterns ever since I laid eyes on her Entrelac Mittens pattern years ago. I'll admit that I was too intimidated to give that pattern a try as Entrelac just seemed too complicated and completely above my skill level. I tucked that pattern in the back of my brain, thinking "one day, when I'm more experienced, I'll knit that". Fast forward a few years to last year's Knit City when Holli released another mitten pattern that I wanted to try out (Gumdrops, in case any of you were wondering) but again, was a bit intimidated to try out - it's colourwork and I like to yank the working yarn tight, so what if my colour changes were crap? I don't know if I could handle that. And again, I tucked that pattern in the back of my brain. Since then Holli's work has popped up again and again, and I keep telling myself to "grow some lady balls and do it!". So when the chance to test knit for her came about this summer, you bet I jumped at it! Little did I know that that test knit would not only be the most enjoyable and thorough test knit that I've ever done, but it would also be one that would encourage and build my confidence in seaming and lead to a spot on the blog tour. So here we are, the last stop of the Tempest blog tour. I was sent a digital copy of the book to review but I knew after "thumbing through the pages" that I wanted a printed hard copy to add to my bookshelf as well. At a glance you can immediately tell that everything about Tempest remains true to what SGY and Holli stand for - the colourful and vibrant photos of SGY; the use of textures and colourwork of Holli; and the clean, classic layouts with thorough instructions and attention to detail that you expect from both. There are SO many details that I thoroughly appreciate about this book: the closeup shot of the highlighted stitch pattern used within the design above the pattern's information; the use of both written instructions and charts; the chart key located right next to the chart itself, rather than having to flip to the back of the book to find out what a symbol means; the detailed and very thorough schematics; the tips and techniques section that talks about understanding ease, how to work with hand-dyed yarns (it even includes photos to show the difference in alternating skeins, pooling, and the use of multiple skeins of slight colour differences); the handy "Tempest Colour Palette" guide for quick references; and the yarn information for all the yarns used in the book in one spot. They're minute details that often get forgotten or not utilized at all. Isn't it just gorgeous? Such a simple design but the ombre effect really just takes it up a notch and if knit in the same yarn that's used in the sample (which is Cashluxe Fine), it's just sheer, every day luxury!! I absolutely love the colour palette that Holli used and when I get around to knitting my own I definitely want to use these colours. Just stunning! The colour combinations for this pattern really is endless. If I didn't see this design in these colours already, I would have such a hard time deciding what colours to choose! I was really surprised to see how different each garment was from each other and yet managed to keep a cohesive vibe. I love the ballet-neckline of Seaswell and feel that its overall aesthetics matches the type of cardigans that I like to knit. I can't wait to knit up Stormwatcher (I'm having a hard time choosing a colour!) and think it could be a wardrobe staple come Spring (if I could get it knit up in time!). I love the oversize, comfy feel of it - although I would most likely have to shorten the length due to my vertical challenges - while the lace panels give enough visual and knitting interest. I love all things chevron so it's no surprise that Eventide immediately won me over. I really like the use of the 2 different yarns/fibres to create the contrast and texture in this pullover. Watermark is an A-line, tunic length raglan pullover that features an oversized cowl neck with matching hems and is another piece that offers endless colour possibilities. This particular design doesn't speak to me but only because I tend to stay away from horizontal lines that cross my hips and could potentially cut me in half and make me look shorter than I already am. As for the accessories, well, Breakers is definitely on my 'to-knit list'. The double garter stitch pattern and the type of cast-on that it uses has me intrigued and I absolutely love how oversized this cowl is, and can imagine just how cozy it would be during the cold winter months. I also really like the hat and mitt set that is Procella. Although I honestly don't think I would knit the mitts as I generally don't wear fingerless mitts that often. The hat though, is definitely right up my alley. 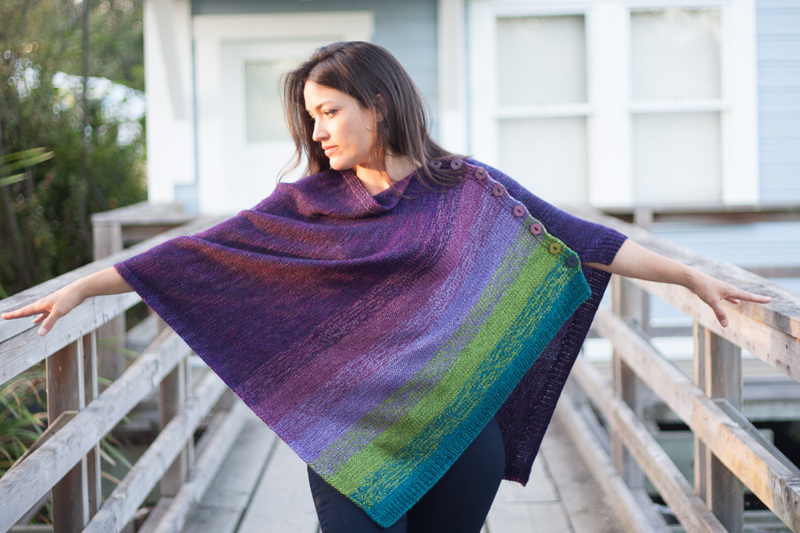 It's slouchy, has a non-fussy lace pattern, and has the ability to feature a few special buttons that one hordes until the right project comes along. What? Are you saying you don't horde special buttons?? Another cold weather must: Ebb & Flow. This blanket is offered in 3 different sizes: baby, lap, and throw - just in case you're like me and would love to have a closet full of hand made blankets and quilts but don't have the patience to work on something too large. Knit in chunky weight yarn, the blanket will practically knit itself up! And then there are "the beaches". If you're familiar with the Vancouver area, particularly the English Bay/Sea Wall area, then you'd know about the First, Second, and Third Beaches and how these cowls are connected to them. 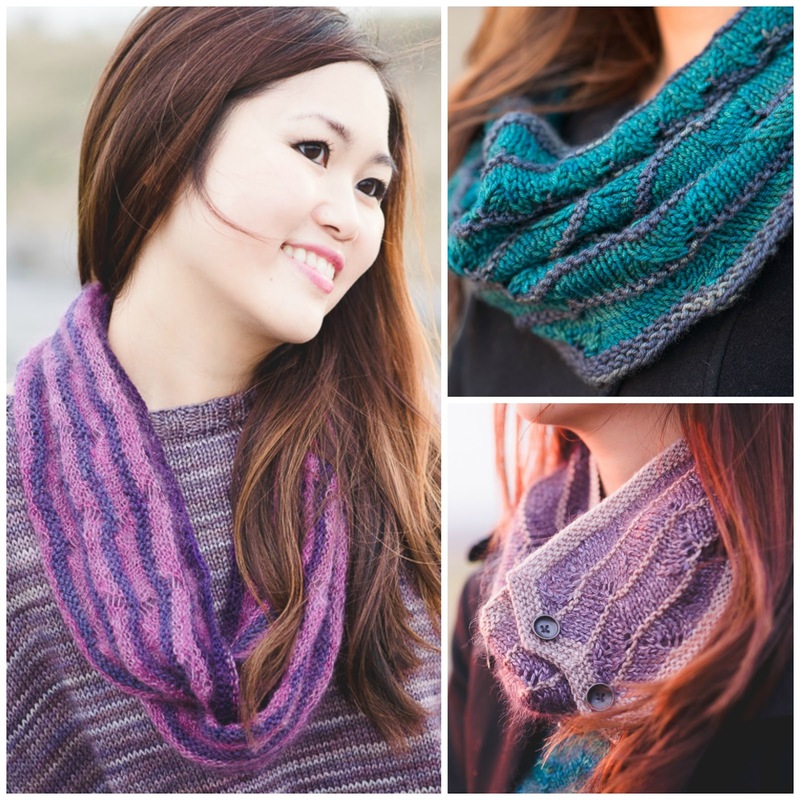 Like the beaches, these 3 cowls are similar but are different in their own way. Such as one buttons up, one can be worn hood-like, and the other deep and cozier - all 3 utilizes the same stitches but uses different yarn and weight combinations. There's a Beach cowl for everyone! Tempest truly is a gorgeous and inspiring book, and judging from the test knit that I did, would also teach even the most experienced knitter a new technique or two! 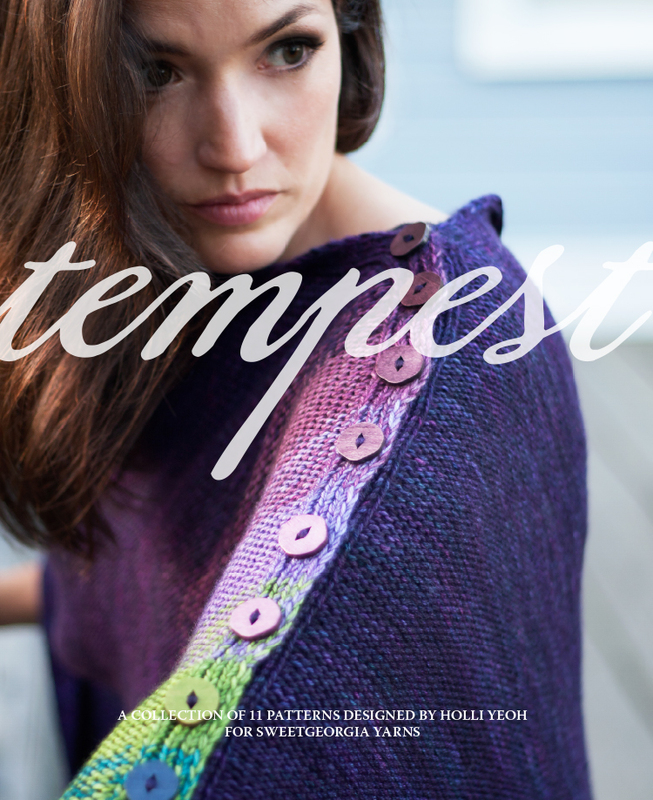 If you would like to get your hands on a copy of Tempest, you can get print copies through the SweetGeorgia Yarns website, the digital eBook from Ravelry, and in January 2015 individual PDF patterns from the Tempest collection will be available for sale (also via Ravelry). Leave a comment telling me which pattern is your favourite and what colour(s) would you knit it in? Don't forget to also include your email or Ravelry ID with your comment, because how else can I get a hold of you if you are the lucky winner? * Please note: all photos in this post are © Felicia Lo, Holli Yeoh, and Rod Yeoh and are used with permission. I am not affiliated with the designer or company mentioned in this post. I received no monetary compensation from the designer or company for my review. Although I was sent a digital copy of the book for review purposes in exchange for posting the review, I had purchased a print version (hard copy) of the book with my own funds. The opinions I've written are my own and I will not be receiving any commissions from this post or from any of the links provided. I'd knit Seaswell in Auburn. Gorgeous! While I adore the look of Stormwatch, it is not a style that would complement my figure, so I'd start off with a deep First Beach in Cypress with a pop of Blood Orange. And then I'd probably look at Seaswell in Deep Cove after the holiday knitting for others is done. I'm in love with Haven! I am torn between whether I would do it in the beautiful jewel tones as shown, or maybe in earthy tones, like: Goldmine, Ginger, Auburn, Pumpkin and Espresso. Oh man, it would definitely be Breakers, in Mulberry..... it would look so luscious! I think Eventide is the most intriguing and I think it would be beautiful in Birch and English Ivy. alcbrooks on Ravelry if I am so lucky! Stormwatch is beautiful and I would knit it up in anything blue/green. Thanks. Storm watch. I am completely smitten. In Mulberry or Oxblood!!! Haven is my favourite! And I would have to use the same colours as the picture. Simply stunning! Eventide is hands down my favourite! I haven't knitted a sweater yet, but I hope to tackle one soon and this one is definitely on my list! I would knit it in exactly the same colours as the sample above, it's stunning! I love Procella. That is a seriously stylish set! I love Stormwatcher. Would definitely use Slate. Wow - definitely Breakers. Gorgeous. expectingsam on ravelry. Haven in the ombre colors you show in the post. Fantastic review!!! I fell in love with Haven the moment I saw it! Even though the colors used in the design photos are out of my comfort zone I think I would actually use those same exact colors because it is just so stunning! love the breakers cowl. would probably purloin color ideas from holli's instagram or just head to sweet georgia and gather inspiration. Eventide is my fav! I love Sweet Georgia Goldmine and Cayenne. Tumbled Stone would look lovely too! 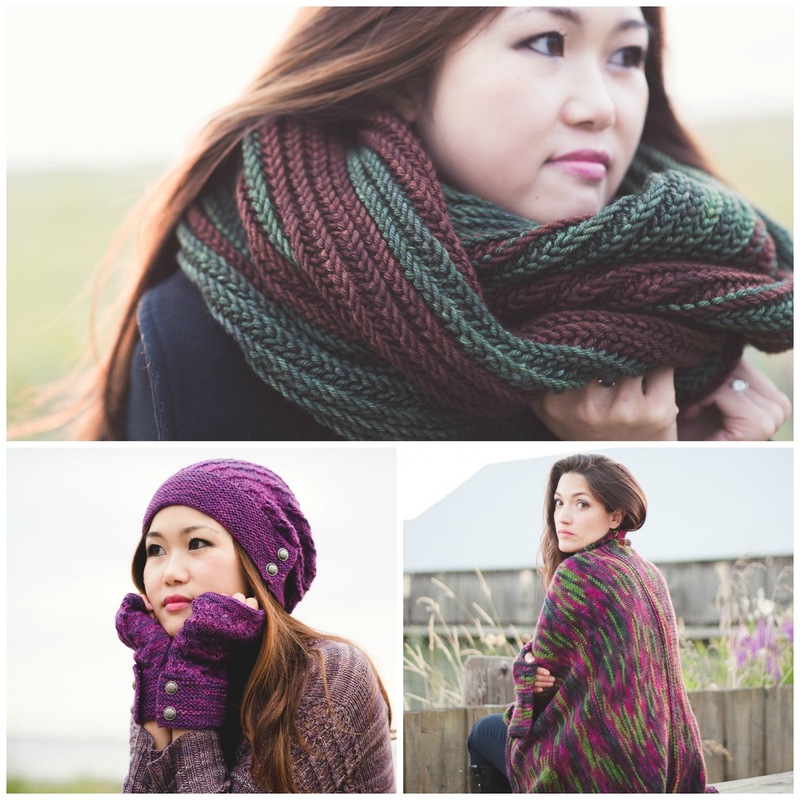 I'd love to knit all three beaches cowls - they are all very intriguing! I am totally digging breakers. I would really like to attempt that pattern the most rav id is yollma. Call me crazy, but Haven peaked my interest! I would likely try to color match the Yarns called for, it's stunning as is! I like the stormwatch top. 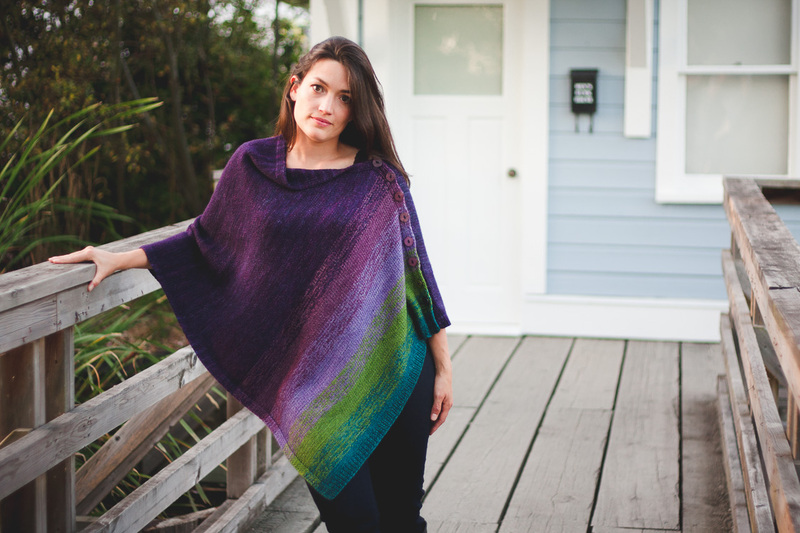 All the designs are gorgeous, as you say, but the ones I really want to knit are the cowls. They are so useful right now, and are relatively quick knits. Each design is so different! And I can see that using a variety of colour combinations would result in so many unique designs -- which would amaze non-knitters! All this is important! I heart breakers! All the Sweet Georgia Superwash Six colorways are gorgeous! I'd probably go with deep cove and riptide.